Sous les pavés, la plage ! (Under the cobblestones, the beach!) was one of the slogans used in France’s 1968. It expressed the desire that beneath the city which had been hardened by stone, there be the freedom of the beach (represented by the sand in which the paving stones were placed). The work commits a certain reversal of the meaning. At the level zero, there is the concrete, that’s the point of perspective, under the pavement should be the sand of the beach, symbolising freedom and nature. The sand is thus taken from underneath and placed on the top, with such difference the sand is no longer the representative of nature, but an industrially produced material ( the place taken by concrete in the original metaphor) and thus we end up with crystal, common and without value like the sand in fact, yet for some strange reason considered valuable. 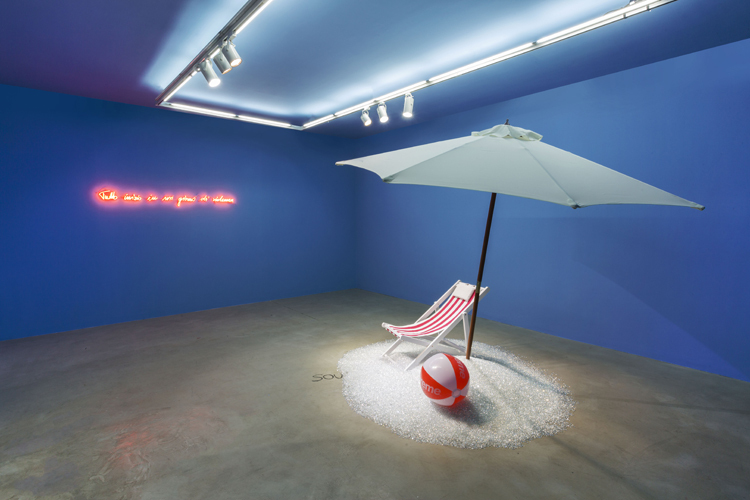 The installation is constructed through an intricate study of historical frameworks: the poetic title somehow provides us with, as in most cases, romanticised image of history, but so is the visual language: the blue walls, the beach chair and umbrella, they all bring an image of some sort of vintage holiday advertising, only crystals which replaced the sand bring us closer to the contemporary, for in the language of contemporary media nothing is allowed to be real, i.e. imperfect, and can there be a less imperfect replacement for sand, if not the crystal which, incidentally, is made of it. The work has a double basis: one is that of analysis of history, a turning point of several narratives which 1968 represents, but the second most importantly explores the two ever-present aspects of human civilisation: the violence and freedom. Beneath the poetic phrase of the past thus lays actual brutality and anger of the French fighters for freedom and all the pre-1968 ideals which have never quite played out. 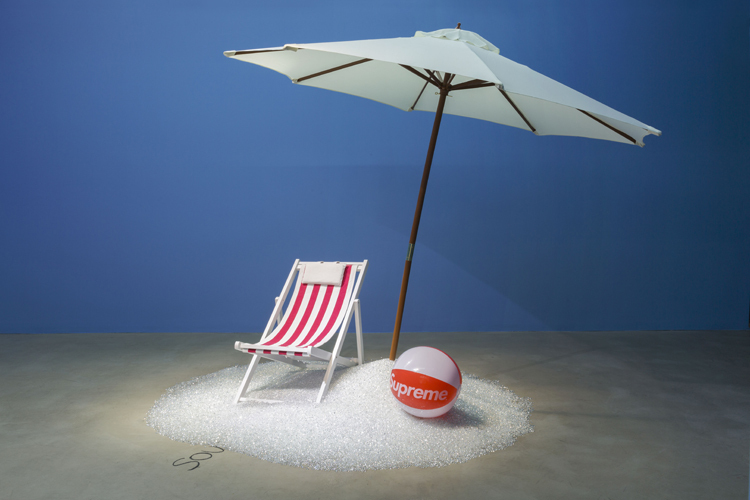 In a simple gesture of installing a beach the work summons heritage of the 20th-century failure (with which we are yet to deal properly) and assembles it with characteristics of the contemporary consumer societies. Here, the existential aspect of the fighting for freedom of the French protesters is juxtaposed with the existential framework of contemporary society where existential meaning is verified not through a dramatic struggle for freedom, but consumption. 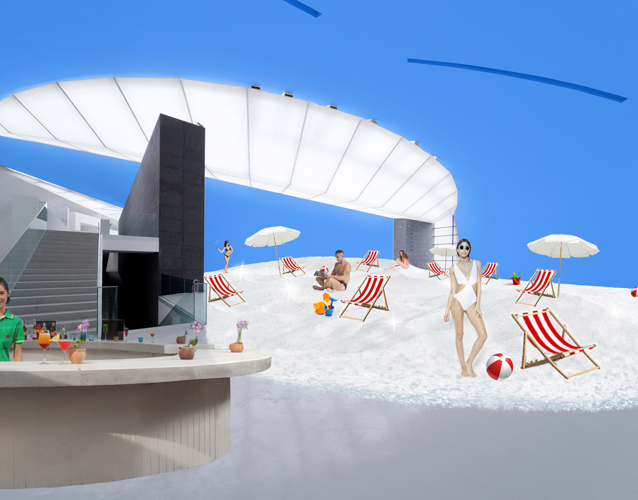 Another version of the installation multiplies its original form and additionally is meant to function as a place of activity: a beach where people undress and gather, rest at the beach chairs, sunbath, play, take pictures, etc. 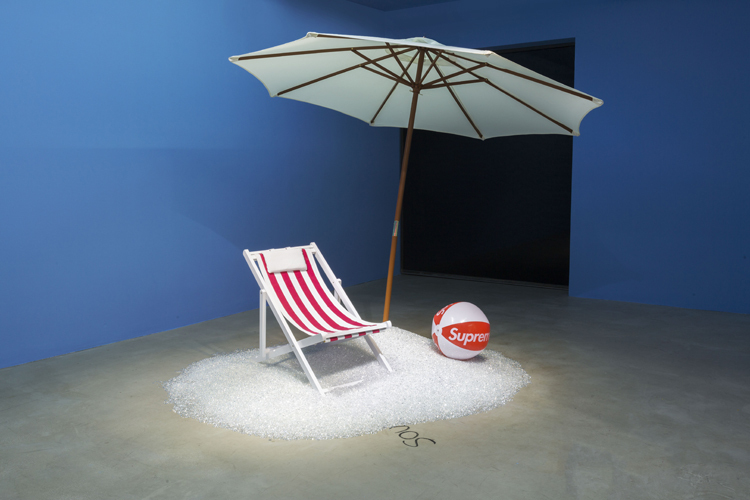 As a very primaeval form, the beach imposes and forces us to look into the contemporary modes of existence from the perspective of our human nature. Moreover, it makes a critical hint towards the role of the museum in contemporary consumer societies, from an institution validating art history, to that which is meant to attract and offer lifestyle fulfilment to the local community. The installation from that side challenges the institutionalised nature of the art museum together with the freedom of the creative act and politicised implications of historiography, directing its visitors towards free self-organised collective activity. 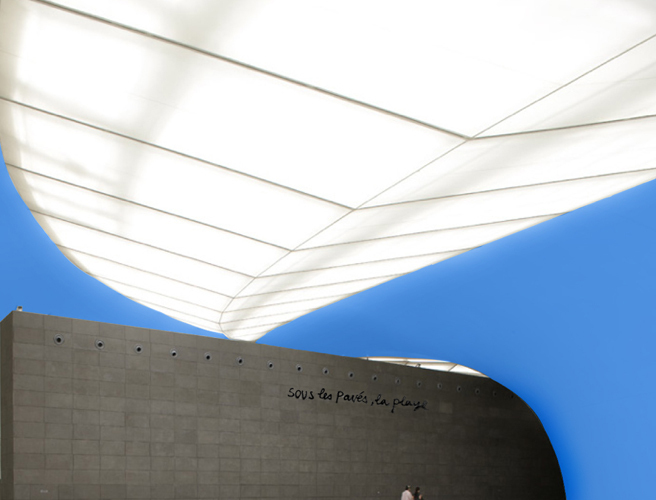 The installation becomes very carefully incorporated in the organic architecture of the museum (in this visualisation from a proposal for CAFA Museum in Beijing). ‘Sous les pavés, la plage!’ sprayed upon the grey wall is reenacting one of the famous ‘acts of vandalism’ through this France’s 1968 slogan. This time, however, the text is sprayed on the wall of the museum, a public space different to that of the street, an institution which would originally be used for storing, studying and protecting products of culture but also which does not allow any of these products in. The slogan visible high up, on one hand, makes it look as if the institution was taken over by the masses, which, then, proclaimed their own collective political standing in place of, traditionally, an individual artist. On the other hand, the recurring memory of 1968 makes one realise the mass, after all, is a force, but without organising and with slogan alone, it becomes susceptible to what is seen below: a pacified society fulfilling its role and purpose through consumption of lifestyle or fashionable products and art alike. 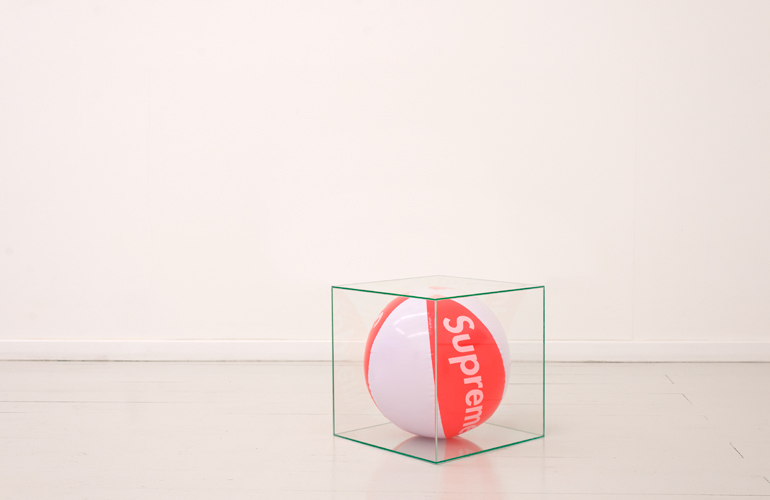 The artist places his physical product in a container representing structures of the contemporary society (the Supreme ball). In the process, the act is placed and follows a historical narrative (Duchamp -> Manzoni -> Martychowiec). This paraphrasing gesture is reversing the original one (Warhol); it brings the creative act back from the work of consumption to the work of (basic) physical creation, and most importantly, towards the narrative it is attempting to redirect. 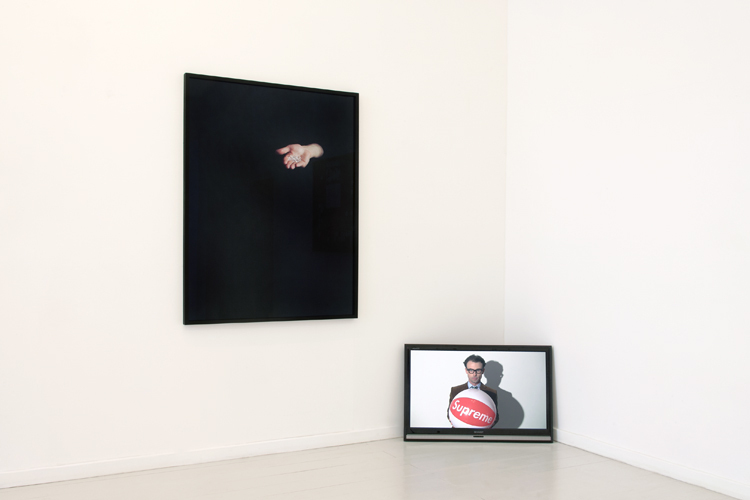 The film’s value emerges, as with most of the artist’s works, in a relationship to the other products of his practice. In this sense, the film’s function is that of a documentation. What matters is what becomes of the branded artist’s breath. In one case it becomes a hidden symbolic and metaphorical object within a conceptual work of art by the same artist (Sous les pavés, la plage !). At the same time, another one becomes encapsulated within a glass cube. 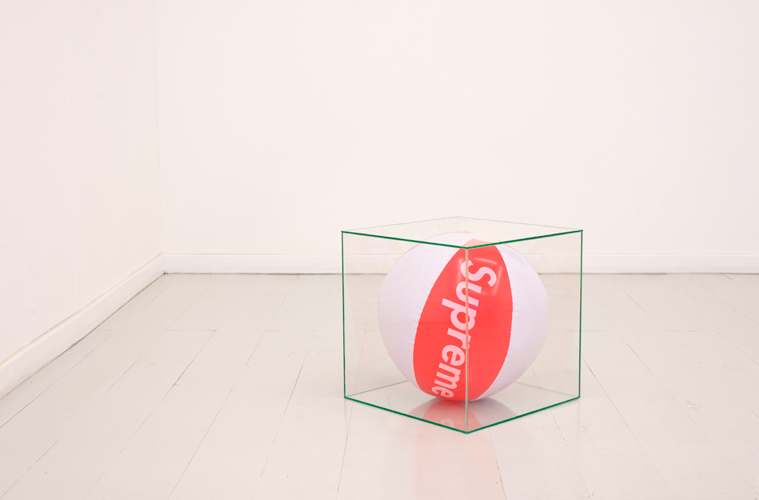 The product of the artistic activity (creation) and the product of the contemporary consumerist society (consumption) belong both to the same time, and as such are contained and preserved within a sort of airtight archaeological display together, as if they were both objects of times long gone, and both became part of history. The video documentation constitutes to the myth of the artist who inhales history and exhales his own creation. This, in its own right, is sufficient and thus he boldly pronounces his name towards the end of the activity, as if he was signing his work. As Hölderlin writes “What remains the poets provide”. The remnant in question is a relic of the mythical act which as the historical necessity dictates, proliferates here and there. reenacts a historic work by Giovanni Anselmo – Hand indicating. It marks another point in Martychowiec’s historical narrative and, specifically, positions his practice in context to the passed post-modernity. 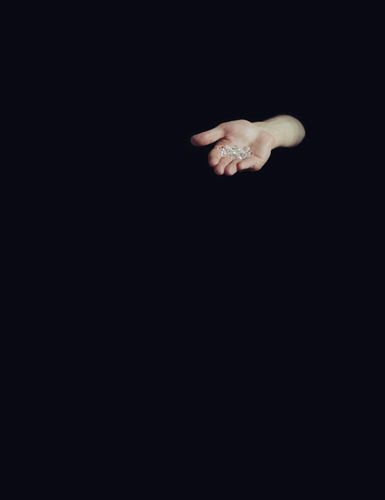 Anselmo’s strong gesture, as its title suggests, offers essentially an empty hand and thus not what normally the hand would hold, but rather the direction. Hence, what is developed within the discourse is the framework rather than the value of individual elements – a typical post-modern approach. What Martychowiec is, however, indicating, is importance of symbolic elements, whose value and meaning are developed within his continuous artistic practice. The direction is suggested, but its value and meaning can only be determined in regards to the specific signifier. This symbol, among others, can be found in his preceding but also future works and the means to read it are offered throughout his body of work. In case of this narrative the crystal, the Supreme, they both represent specific historical and political conditions which become some of the topics of Martychowiec’s story. The title of the work is taken from poem Andenken, in which Friedrich Hölderlin declares what poetry is: poetry is founding by the word and in the word, and what is established in this way is – what remains. The poet names the gods and all things with respect to what they are and thus they come into being. In this way, the artistic symbols, once develop, acquire ‘life of their own’ and can function independently outside of their initial paradigm, of course, with the possibility of being always traced back to it and read within it.